Celebrate your next holiday, function, event, or special day with Fresh Beginnings Gourmet Cookies! 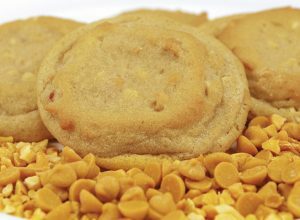 These unforgettable, soft baked Gourmet Cookies are fresh-baked and hand-made just for your order. 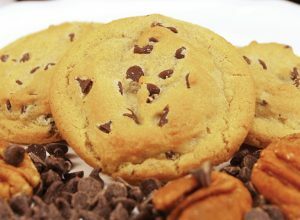 Choose your favorite cookie flavor in the Cookie Flavor Dropdown when ordering. 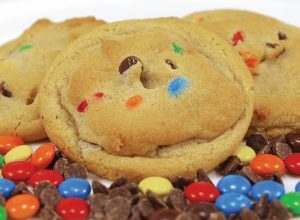 All of our cookies are prepared with only the freshest ingredients and shipped the same day they are baked! 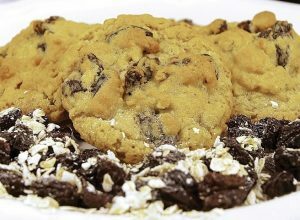 Fresh Beginnings cookies contain no preservatives, capturing a home-made taste that will keep you coming back for more. *Specialty cookie flavors are not available at all times. These flavors are marked with a *. Check back regularly to see what's baking! 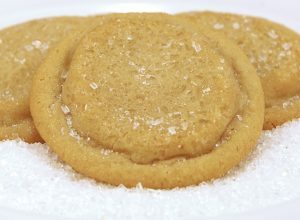 Our signature cookie that is also a classic! The perfect amount of rich milk chocolate chips are baked into our signature dough giving every bite that "right out of the oven" taste. 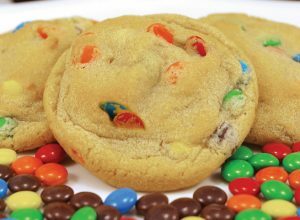 A year-round favorite featuring our chocolate chip cookie with colorful candy-coated chocolate pieces baked in. 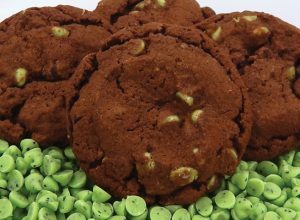 A rich, soft-baked chocolate cookie with creamy mint chips. A chocolate mint lovers dream cookie! A combination of the finest, freshest Georgia peanuts and creamy peanut butter - a little tribute to Fresh Beginnings' home state! 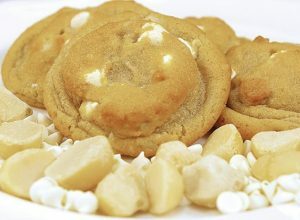 A blend of exotic and crisp macadamia nuts and rich white chocolate chunks are baked into our signature cookie dough making this a crowd favorite time and time again. Not a chocolate fan? 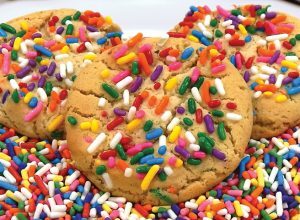 These delicious cookies are sprinkled with a variety of colored crystal sugar. Have an event coming up and want to coordinate your cookie colors? Just let us know! This gem of a cookie is a true classic with lots of fun and colorful candy-coated chocolate pieces baked in! A delicious combination of oatmeal, plump raisins, rich brown sugar and spices. 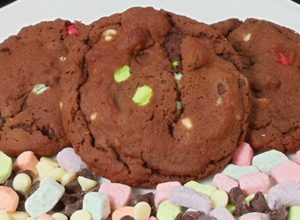 Colorful and creamy marshmallows baked into a chocolate cookie make these cookies a delicious snack and an excellent addition to any dessert table. 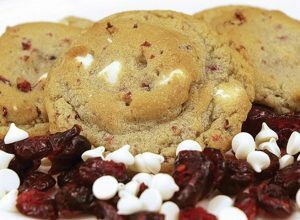 Dried cranberries give these cookies a bright festive color and provide a tart flavor burst in each bite. 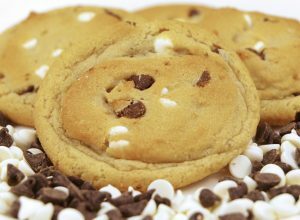 Smooth white chocolate chips up the ante and make this cookie a holiday favorite! 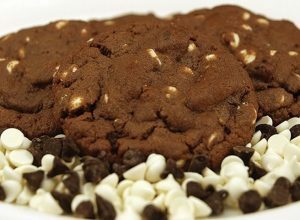 A mouthwatering and rich chocolate cookie chock-full of white and milk chocolate chips. 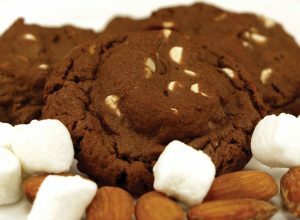 Just like the ice cream, these delicious cookies feature a winning combination of mini marshmallows, white and dark chocolate chips and crunchy almond pieces. that "right out of the oven" taste. with a variety of colored crystal sugar. colors? Just let us know! to make this an unforgettable cookie. cookie with creamy mint chips. rich brown sugar and spices. addition to any dessert table. white and dark chocolate chips and crunchy almond pieces. this a crowd favorite time and time again. a tart flavor burst in each bite.